Do you have your dancing shoes on? 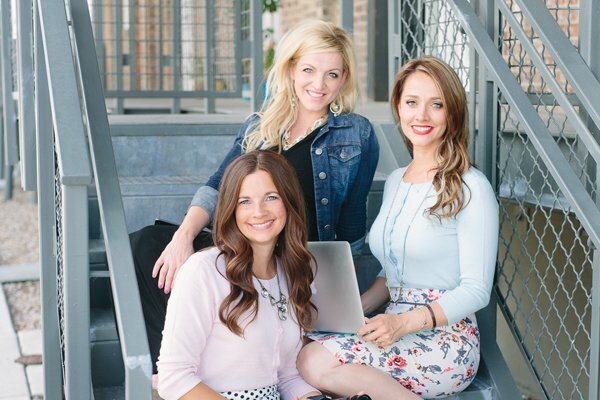 Be ready to do your happy dance, ladies, because our guest this week is one craftalicious babe! May I welcome Christina Nease from “Celebrations At Home”. She is a party-planner, decorator, and designer extraordinaire and she is sharing one drop-dead gorgeous baby shower with us today. Whether you are expecting your own sweet bundle of joy, or planning a shower for a friend you will be blown away by Chris’ gorgeous creations. But, I’ll let her work speak for itself. Take it away, Chris! 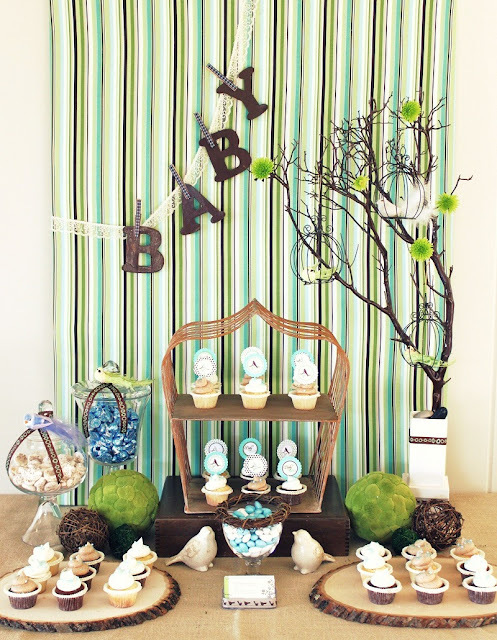 This past weekend I designed a baby shower for the Richmond “Dream Baby Shower” contest winner. This is a locally sponsored contest (with $1500 worth of prizes) that is presented by Richmond Mom and introduces expecting mothers (nominated by friends & family) to readers, who then vote for a deserving recipient. 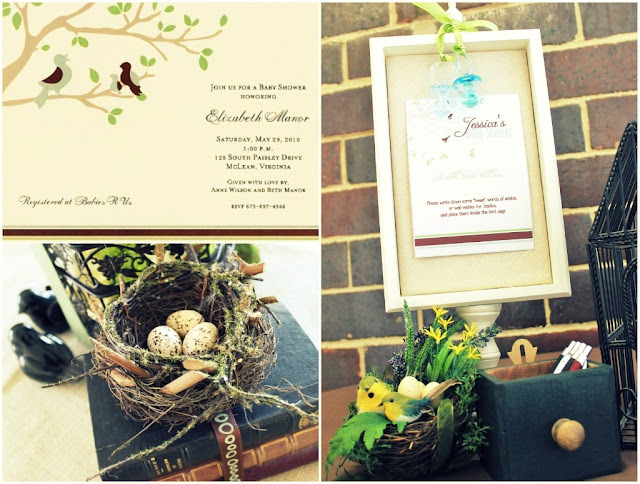 The winner of the contest is expecting twin boys and chose an invitation from By Invitation Only, with a lovely birds-in-a-tree motif. This turned out to be the inspiration for my design. 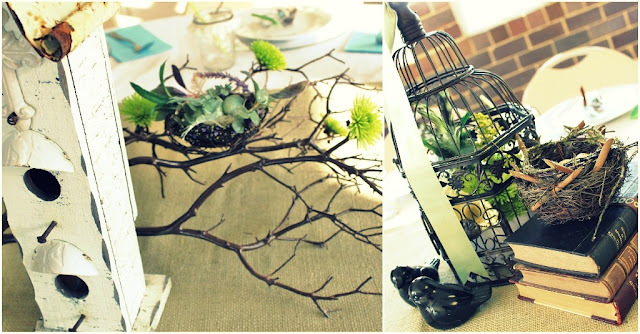 We set the scene with 4 different, but coordinating tabletop designs. 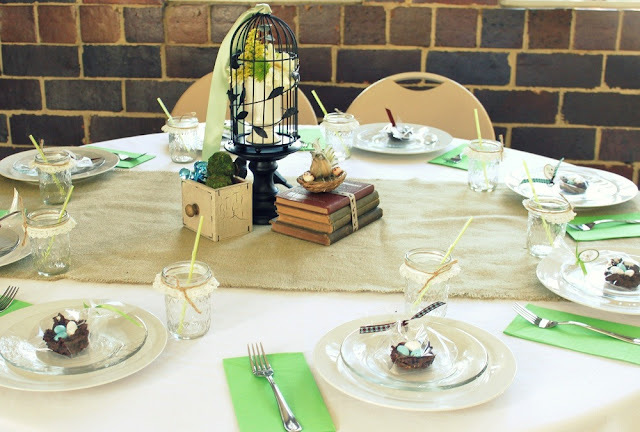 We used burlap runners on all the tables, with 2 tables featuring birdcages and rustic accessories, while the other 2 featured branches with rustic bird houses. Florals were done in shades of green and white, and small button flowers were attached to the Manzanita branches to add color and detail. The button flowers are very hardy and hold up without being in water, so I cut the heads off the stems, hot glued it to a piece of yarn, and tied it onto the branches. 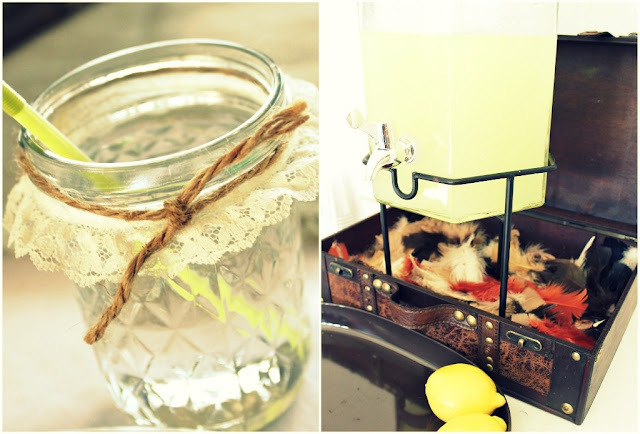 Place settings were simple white and clear plates with embellished canning jars used for drinks. 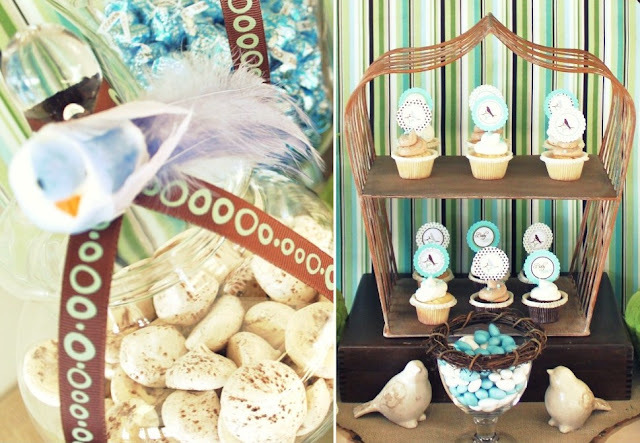 Each guest received a tiny chocolate birds nest favor with Jordan almonds (eggs) inside. I made the nests by melting dark chocolate and mixing in crushed shredded wheat cereal and crunchy chow mein noodles. I then created a “nest” by filling the bottom of a muffin tin with a bit of the mixture. Place the “eggs” (Jordan almonds) inside the nest while the chocolate is still melted so they will stick to the nest without falling out. Let it harden in the refrigerator. The dessert table is always a lovely focal point at parties. 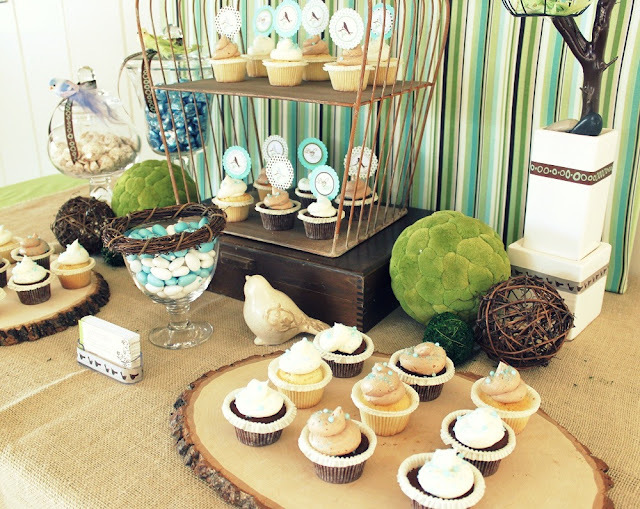 Delicious cupcakes from Two Sweet cupcake boutique were provided and dressed up with toppers from Bird’s Party designs. The backdrop is a painter’s canvas wrapped with fabric. 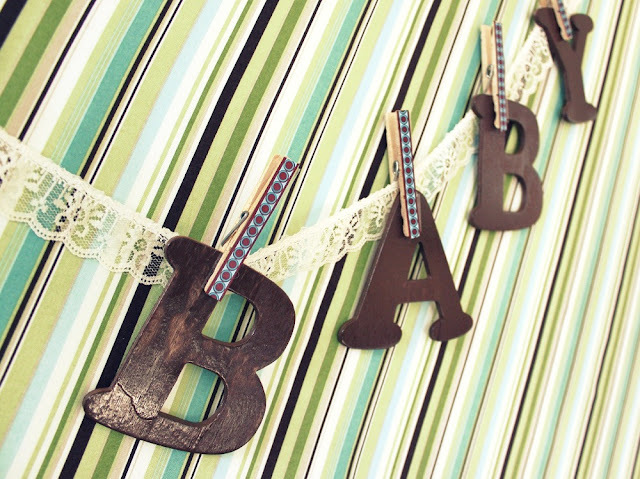 I made a “BABY” banner by draping lace across the front and attaching painted wooden letters with a cloths pin covered by ribbon. 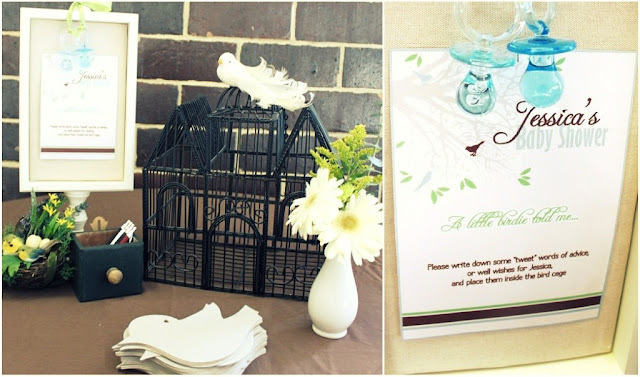 Bird’s Party also created the “baby shower” sign which instructed the guests to write a few words of wisdom for mom and place it in the bird cage. Alright, ladies. Time to pick those jaws up from the floor. It makes you want just ONE more baby so you can do this, am I right? Or a LOT of friends who are expecting, at least. 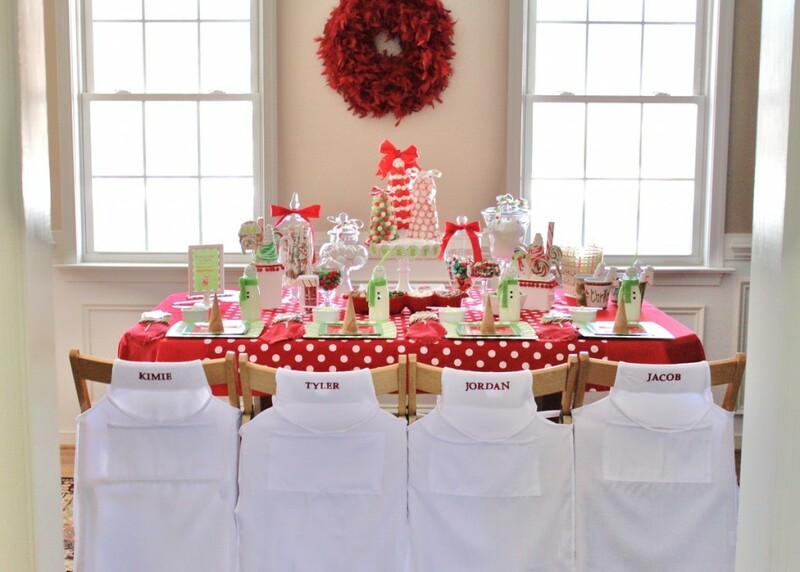 Who knew how elegant a baby shower could be? If you loved this (and I have a feeling you did) you will not want to miss these other great ideas from Christine! Thanks, again Chris for sharing your phenomenal ideas with all of us. Each and every one is absolutely elegant and gorgeous. I hope you’ll join us as a guest again VERY soon! Which of these amazing ideas inspired all of you? I can’t wait to hear from you! « Is it time to Potty Train? 10+ Helpful Tips! WOW!!!!! Truly the most beautiful baby Shower I’ve EVER, EVER seen!!! Stunning job Chris!! So pleased I was able to be a part of this fabulous day!! Chris is a remarkable talent! 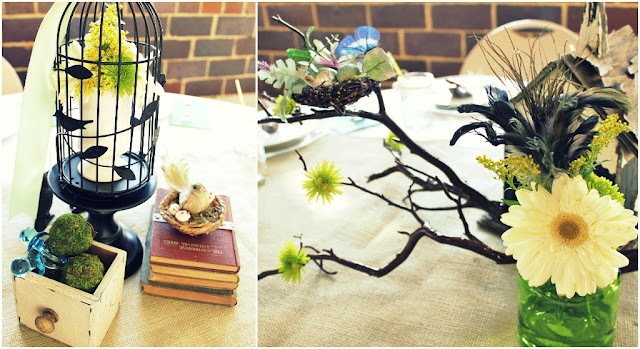 I am always so inspired and awed by her party tables…. thanks for sharing this amazing display of creativity! Chris always does such a wonderful job!!! Absolutely stunning! Of course, everything that Chris designs is incredibly fabulous. Every tablescape is just gorgeous! I could stare at these all day! This is BEAUTIFUL!! I love all of the amazing details! Chris is a superstar!! I’m loving the “nest” favors (along with all the other stuff)! Very cool! Chris hits it out of the park again! Lovely! Soooooooooooo GORGEOUS! Celebrations at Home always has great party inspiration. How have I never heard of this woman?! She is AMAZING! Seriously, when I grow up I want to throw parties like Chris. Each of those pics were incredible. I especially love the sweet 16 party. SO fun! PS thank you for featuring/introducing her to me HowDoesShe. You girls rock! So very cute! Great job Chris- another amazing accomplishment! I love it! The colors are perfect. Can you give me the name of the beautiful striped fabric used as the backdrop? Great job :)!!!! Oh No, Christi! I’m sorry I have no idea the name of the fabric. I got it from Jo-Ann’s fabric/craft store in the green-blue calico area. They are awesome and oh, so cute~!!!! Did I miss something??? ” The most beautiful baby shower” my standards are obviously different. I lOVE all of the birdies you used in this! Such a cute idea! I’m not expecting a baby anytime soon, but I would totally love to have a shower like this whenever I am!